We addressed a small UX issue in our dashboard application this week. A blog-post-worthy UX issue? Not really. Transparency in the process of how we address issues however, can greatly benefit our customers and their experience with our products. Contributing to the EmberJS community motivated our decision to open source the dashboard. Often available applications are small and optimized for evaluating the framework quickly. Sharing our production application builds on the many smaller examples and helps answer bigger questions around code organization, utilizing components, and test coverage. We use a copy-to-clipboard action throughout the app for long strings that a user would likely need to paste in a terminal (database connection strings, git commit references, links, etc.). A user reported some confusion via one of our support channels when the click-to-copy link reloaded their browser. A github issue was created and diagnosed the root of the problem. In browsers without Flash, the component was not set up and a link with a common placeholder destination, triggered the reload. Because the dashboard is open source, anyone with a free github account can create, comment, and follow issues. A new open source tool, clipboard.js, was noted as a possible solution. It does not use Flash and offers a nice fall-back for unsupported browsers to get targeted text on the clipboard. Note, the tool’s creator, zenorocha chimed in with a +1 and a wink. Feel the open source github love! The click-to-copy component used in the dashboard is part of our shared library, ember-cli-aptible-shared, also open source. After making changes to the component, we updated the dashboard, and problem solved! Code change discussions are out in the open, tagged and timestamped. Customers can submit or comment on issues directly. The community can learn from and build on our open applications’ structure. Recruiting. Like what you see? dashboard Aptible’s customer dashboard (aka Diesel). It allows users to manage organizations, access controls, and ops. aptible-cli Command-line interface for Aptible services. opsworks-cli An alternative CLI for Amazon OpsWorks, focused on managing a large number of similarly provisioned stacks. docker-nodejs* Sample Docker files to get various versions of NodeJS running on Docker. docker-cron-example* Example implementation of cron jobs on Docker/Aptible. 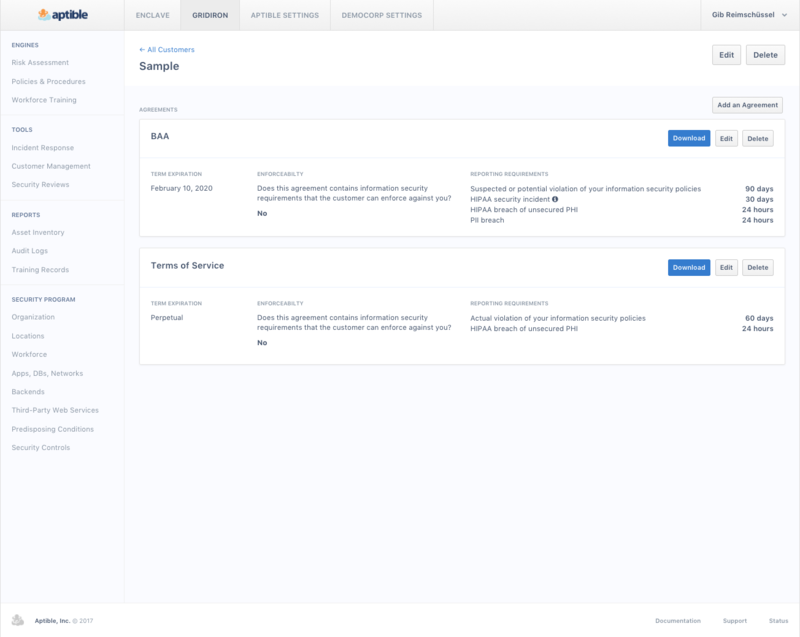 * To see the latest Dockerfile examples and Docker related repositories, view all of Aptible’s repositories and search for Docker.